Sometimes it pays to raise your voice. Last month, we reported on how the future of food in Uganda was under threat from a new “Bio-Safety Law” which was in fact a thinly-veiled legalization of the productions of GMOs, and which would make Uganda only the second country on the continent (after South Africa) to allow their cultivation. As we reported, the Bill had already been approved by the Ugandan Parliament in October 2017 and was thereafter sent to the President, Yoweri Museveni, for his approval. In an extraordinary turn of events, it seems that the call of Slow Food for a reappraisal of the proposed law has had some effect, as evidenced by the President’s letter to the Speaker of the Ugandan parliamentwhich is heavily critical of the Bill. In it, he talks of the importance of the country’s “ancient crops and livestock with unique genetic configuration”, and of not forgetting “the original preservers, developers and multipliers” of this biodiversity, i.e. the country’s small-scale farmers. He also questions, rather wisely, the proposal to plant drought-resistant GM seeds in irrigated areas, insists that the law clarify that GM material not contaminate non-GM crops, and on clear labelling for any GM products. Though it stops short of rejecting the Bill outright, the President’s letter asks for a parliamentary review of several of its clauses and a change in the Bill’s title, such that it clearly refers to genetically-modified agriculture rather than the vague, meaningless “Bio-Safety” as originally proposed. 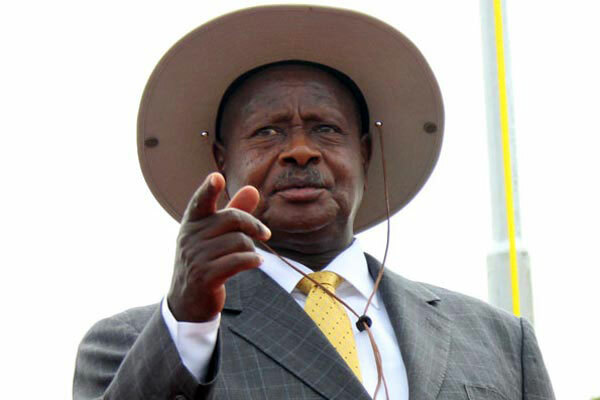 President Museveni of Uganda. Photo: The Daily Monitor. Perhaps most interestingly, President Museveni requests that the Minister of Agriculture to plan a “Noah’s Ark where all our unique indigenous material will be kept, uncontaminated with any GMO, for future use if there is any crisis within the modernization efforts.” Could this request be inspired by Slow Food’s own Ark of Taste, which catalogs at-risk food from around the world, including 35 products from Uganda? While we welcome the President’s justified doubts and concerns regarding the Bill, Slow Food urges all actors in Uganda to go that one step further, and avoid the enormous risk that legalizing GMOs would mean for the country’s rich, unique and irreplaceable biodiversity: by abolishing the proposed new law altogether, taking such steps to insure the future of the country’s food security—which is implicitly being put at risk—may not be necessary in the first place. Slow Food Uganda and Slow Food International demand a rerun of the public consultation regarding the Bill within Ugandan civil society and with all stakeholders, and the revised text of the Bill sent back to the President be made available for public discussion and consultation. The future of food concerns us all, from the President down to the small-scale farmer, and on such a vital matter it is imperative that the voice of democracy rings louder than corporate interests. The New Earth Market is Under Preparation! Fruit and Juice Party: Giving Real Value to the Diversity of Ugandan Fruit! FOOD WISE EVENT CELEBRATING UGANDA’S INDIGENOUS AND TRADITIONAL GASTRONOMY!